In March 2016, the Commission published a proposal for revision to the EU Fertilisers Regulation COM (2016) 157 final 2016 / 00084 (COD) with the objective of placing secondary raw materials on the EU fertiliser market in order to protect primary raw materials. It aims to enable recycled organic fertilisers and soil improvers (composts and digestate products) access to the EU internal market so that they can compete on an equal level with mineral fertilisers. 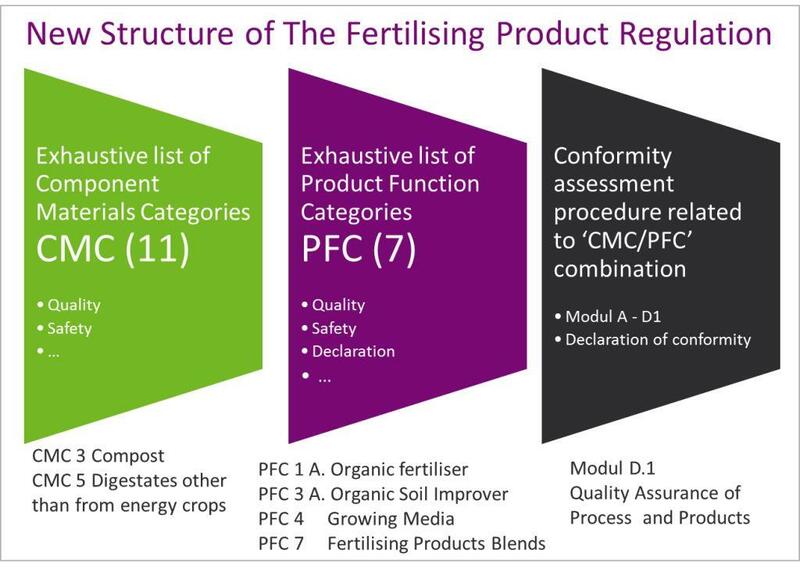 The proposal, titled as Fertilising Product Regulation, sets out criteria covering safety, quality and labelling that all fertiliser products must meet so that they can be freely traded throughout the EU. In addition, quality requirements for specific raw materials for the production of fertilisers, soil improvers and growing media are specified in the annexes. For compost and digestate products, these specific requirements are based on the JRC Report 2014 (End of Waste Criteria for Biodegradable Waste Subjected to Biological Treatment) © European Commission in 2014, EUR 26425. In addition to requirements covering the production process and product quality, only separately collected organic waste is permitted as input materials for composting and anaerobic digestion. The proposals also define a list of component material categories (CMC), of which compost is CMC 3 and non-energy crop digestate is CMC 5. Specific labeling requirements are also set out for product function categories (PFC), which are subdivided into fertilizers, soil improvers, growing media, liming materials and biostimulants. Manufacturers of these product groups will need to demonstrate that their products comply with environmental and health requirements (limit values for physical and chemical contaminants) in order to display the CE mark on their products. In addition, compost and digestate products manufactured from waste must be subject to external quality control, which is recognized by each Member State through a conformity assessment. In order to avoid creating additional barriers to the marketing of established secondary raw materials in national markets, the Commission envisages optional harmonization of the revised Regulation. This means that compost and digestate manufacturers can decide whether to label their products with the CE mark: they can either freely trade their CE-marked products on the internal market in accordance with common European rules, or simply market their non-CE marked products according to national rules.